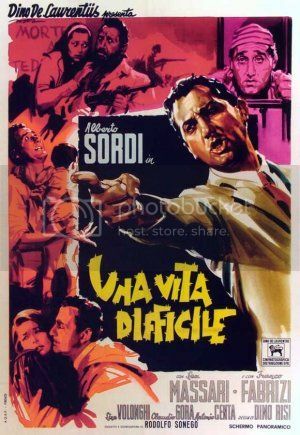 Una vita difficile (A difficult life) is the frustrating, Odyssean tale of Silvio Magnozzi (Alberto Sordi) as he navigates the post-war Italian landscape, trying to balance his partisan ideals against the harsh pragmatism that the poverty-stricken surroundings engender. Essentially covering the same ground as C'eravamo tanto amati (which we much preferred), Una vita difficile starts with the same nostalgic romance of partisan fighting in WW2. Silvio, suffering from bronchitis as he treks through the Lake Como countryside, narrowly escapes being shot by a Nazi when Elena (Lea Massari), a local girl, kills the Nazi with her iron (whoa). Thus follows their brief three-month affair, after which Silvio flees to join his partisan band and, once the war ends, moves back down to Rome to pick up his pre-war journalism job for a left-wing daily. A work trip up north reunites Silvio and Elena, who decide to get married. They return to Rome, where they live in borderline starvation. A son is born. Silvio is offered a position which contrasts with his left-wing morals; he refuses. Eventually, his unrestrained idealism lands him in jail, and Elena takes their son back up north. This basic tension - Silvio's ideals versus cynical reality (often embodied by Elena); the poor, proletarian South of Silvio versus the bourgeois, industrialized North of Elena - is played out throughout the film in a variety of ways. And all of this stuff was covered in the later, better C'eravamo tanto amati. Certain scenes - the happy crowds following Rome's liberation, the working-class trattorie with the wandering trumpet player - are even identical. Yet while Una vita difficile seems as well-remembered as C'eravamo tanto amati, we prefer the latter. It approaches the same subject with greater grace and more equanimity. Silvio's inability to let go of his idealism (and his indignant righteousness), to the point of driving away his family, is akin to Professor Palumbo's extremes - except Palumbo is articulate, off-kilter, hilarious and a sympathetic caricature. Silvio, instead, alienated us: he seemed an unlikable combination of entitlement and self-pity. Of course, despite the identical setting, it's a harsher version of the same world that these characters live in, compared to C'eravamo tanto amati. Compare the trattoria scenes: in C'eravamo, the characters struggle by with half-portions, in Vita, they can't even pay for anything and are kicked to the curb. The requisite sell-out scenes, when Silvio succumbs to becoming a vile commendatore's underling, are full of humiliation and corruption. This extreme view just cements Silvio's righteousness, but it doesn't tackle the real issue: what if selling out does lead to a better life? The character of Gianni from C'eravamo also sells out, but his trials and tribulations are largely existential: materially, he is comfortable and happy. Another reason we didn't particularly enjoy this film is that here, the treatment of women is just terrible. Elena, for however objectively rational and selfless she is (when Silvio implodes, she finds a way to provide a comfortable life for their son), is presented as unimaginative and frosty because she doesn't "get" the cause. Silvio abuses her regularly and, when she leaves him, she is presented as having "abandoned" him. One of the reasons we love Lina Wertmuller's films so much is that she takes these stereotypes of Italian sexual mores - the frosty northern girl, the lusty southern man - and completely subverts them, most often via Giancarlo Giannini playing an extreme version of southern machismo. Consider, for example, Swept Away, where another left-wing, poverty-stricken southerner humiliates and dominates a bourgeois Milanese ice queen. In Swept Away, that relationship is presented as fundamentally ridiculous: compelling in its absurdity, ultimately false. Una vita difficile, maybe because it was made almost fifteen years earlier, is still earnestly enamored with Silvio's status as a man, from Rome, who is poor. This is not to say this film isn't good. It's considered a classic, and it is indeed very well-made. The scene when the starving Silvio and Elena are invited into a royal lady's house for dinner while the republic/monarchy referendum results are announced was surreal and powerful, akin to the "lifestyles of the strange and wealthy" scenes from La dolce vita or Signore & signori. It's not a bad film, from a technical point of view. We just don't agree with its underlying philosophy. As the other northern beauty says to the other left-wing Roman in C'eravamo, "You're the first likable Roman that I meet." 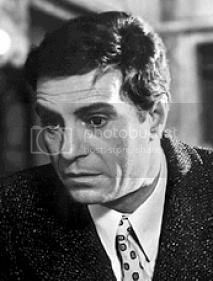 That being Nino Manfredi, who is indeed very likable and who we'll take over Alberto Sordi any day. 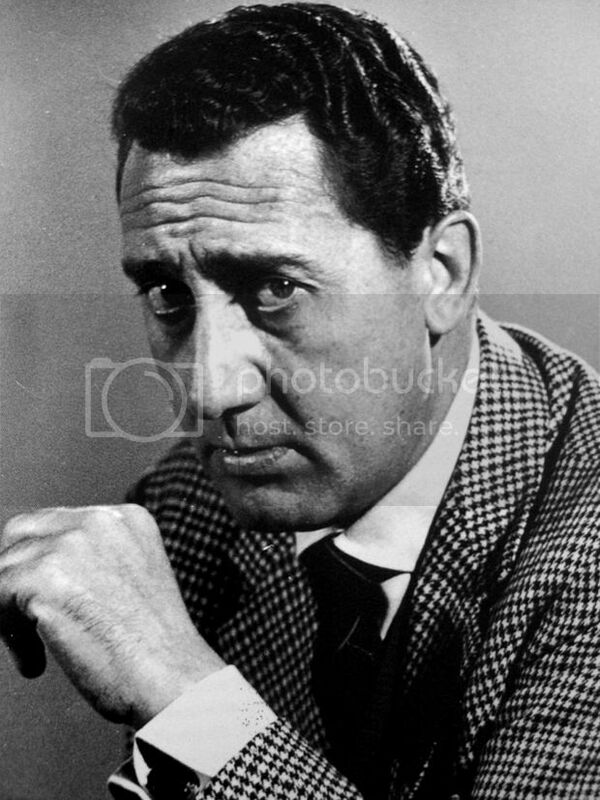 Alberto Sordi is no likeable as a character actor? are you mad?? Dreaming of the Medicis and a house in Tuscany by any chance? Rubbish.